Apple’s iPhoto 5 is anything but another ho-hum digital shoebox. 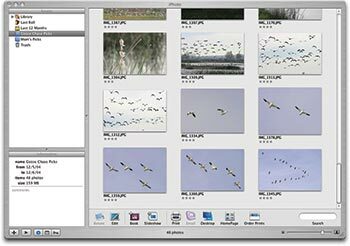 You can use it to create an efficient workflow for managing all your pictures. No more fumbling with folders of obscurely named pictures—iPhoto takes images directly from your camera and presents them to you in an orderly manner. From there, you can do just about anything with them: make prints, build Web pages, create slide shows, and more. Understanding and using iPhoto’s organizational tools will help you get the most out of the program’s creative side. I’ll show you how to enhance your photos, as well as how to use iPhoto to sort them so they’re ready when you need them for any type of output. Do you spend all your time scrolling through your image library looking for shots you need? Just like a garden, a photo library left untended can quickly become overgrown and uninviting. Unless you instill order early and often, you’re likely to spend as much time searching for a photo as you do polishing it. Before the days of digital photography, I used a light box to sort my slides. I’d lay them out side by side on the glowing surface and, with magnifying loupe in hand, rate each image by putting one, two, or three dots in its lower left corner. Great shots had three dots; outtakes, one dot. iPhoto lets you use this procedure on your Mac—but makes it even better. You can not only assign ratings, but also use those ratings as filters to keep your favorite images within easy reach. It takes just a minute or two, and the rewards are well worth the extra effort. After you’ve uploaded a new batch of images, click on the Last Roll icon in iPhoto’s Source list (on the left side of the interface). All the pictures you just transferred from the camera will appear in the photo-viewing area. Create a new album by clicking on the plus-sign (+) button in the lower left corner of the iPhoto window. Give the album a logical name. Now go to Edit: Select All. iPhoto will highlight all the pictures you just uploaded. Drag them into your new album, and you’re ready to sort. Cast a Critical Eye One of the best ways to sort your images is by their star ratings. You have your five-star award winners at the top of the album and your one-star duds at the bottom. This is a huge time-saver for future projects. Instead of having to open each picture in Edit mode to see whether it’s the good one, you can find out just by breezing through the thumbnails and looking at the images’ star ratings. Slideshow Settings View your album as a slide show, and use the Slideshow controls to rate your pictures as they appear on screen. 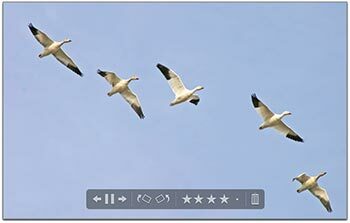 iPhoto’s slide-show controls are perfect for quickly assigning ratings. 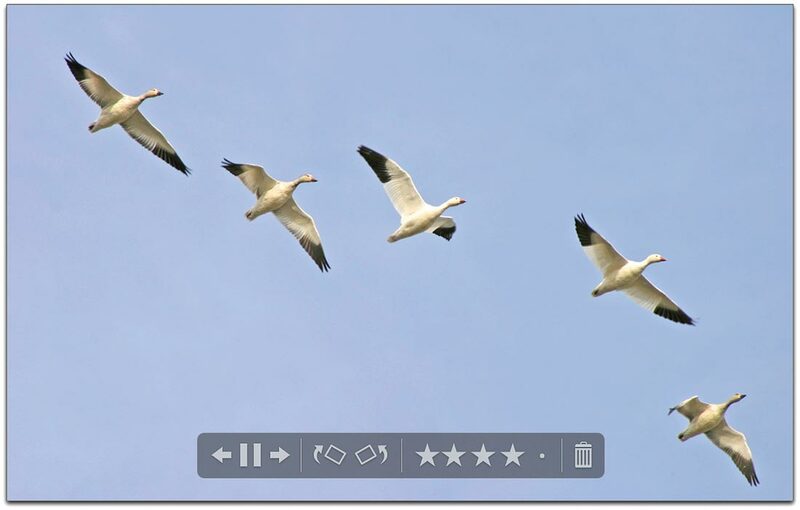 The slide show presents each picture at full screen so you can get a good look at it, and you can use the slide-show controls to rate the images as you view them. That way, you don’t have to click and scroll from picture to picture. To enter Slideshow mode, click once on your album title to highlight it—or select Last Roll if you just imported the images—and then click on the Play triangle beneath the Source list (not the big Play button on the Slideshow toolbar). 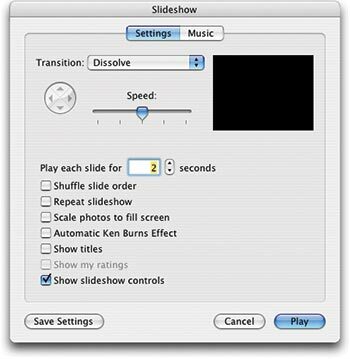 The Slideshow dialog box’s Settings pane will greet you. Deselect all the slide-show options except Show Slideshow Controls. You don’t want anything fancy for this presentation, just a good look at the pic-tures and a way to rate them. I usually choose 2 Seconds for each slide, but I’m speedy (see “Slideshow Settings”). You’ll notice that the control bar lets you pause or play the slide show; go to the previous or next slide; and rotate, rate, and delete the image on screen. To rate a picture, simply click on the dots to assign a star rating. (Once you click, the dots turn into stars.) Don’t fret over this for too long—you can always change your mind later. Just go with your first reaction. Remember, the object here is to move fast and assign a first-impression rating. You can even save yourself the extra mouse click by assigning star ratings from the keyboard. Press Command-1 for one star, Command-2 for two stars, and so on. Fly through Ratings When you use a slide show to evaluate your pictures quickly, you not only get to see much bigger images, but also can rely on your gut reaction to their quality. This image got four stars because I really like it. One advantage to this method is that the slide show gives you big pictures to evaluate. The images appear at a higher resolution than they do in the little preview thumbnails or even in Edit mode (see “Fly through Ratings”). When the slide show ends, you’ll be returned to the main iPhoto window. Make your ratings visible under your thumbnails by going to View: My Rating. Now you can easily see the best shots without having to open each in Edit mode (see “Star Shots”). Even better, go to View: Sort Photos: By Rating, and your very best thumbnails will appear at the top of the album. Use Some Smarts iPhoto also lets you organize your image library by grouping similar photos from different film rolls into smart albums. Similar to iTunes’ smart playlists, iPhoto’s smart albums automatically build collections based on all sorts of criteria, such as date, file name, comments, and so on. I recommend building a smart album that contains all your best pictures. Just think, when it’s time to make holiday books for the relatives, if you have a “Best Shots” smart album, for instance, you can just open it up instead of scouring your collection for decent photos. Star Shots By selecting View: My Rating you can see how many stars you've assigned to each picture in thumbnail mode. You can take this even further by choosing View: Sort Photos: By Rating. The thumbnails will be rearranged with your favorite shots at the top. Start by holding down the option key. The plus sign (+) in the lower left corner of the iPhoto window will become a small gear symbol. This is the Smart Album icon. Click on it. In the dialog box that appears, name your album and choose My Rating as the condition. Use Is Greater Than, and click on three stars. Then click on OK, and iPhoto will instantly build a smart album containing all the pictures from your library that have a four-star or higher rating (see “Only the Best”). Enjoy a Daily Display Now that you’ve located your best photos, why not enjoy them all the time? To show off your photographic prowess, open System Preferences and go to the Desktop & Screen Saver pane. Click on the Screen Saver tab, and select your new smart album from the list. You’ve just created a dynamic, automatically updating screen saver of your prized images. I bet you’ll catch plenty of people slowing down as they pass your desk. Now that you’ve found your best shots, it’s time to edit, right? Not quite. The weak link in any image-editing routine is the monitor. The colors on a monitor shift over time—and there’s little point in editing if the on-screen colors aren’t the colors you’ll get in print. You’ll get much better results if you spend a few moments adjusting your monitor before you fiddle with your pictures. Only the Best You can use iPhoto 5‘s Smart Album feature to create an album that contains only your favorite pictures. If you’re already using a screen-calibration device, such as ColorVision’s $299 Spyder2Pro ( ), you’re in great shape. (To see a comparative review of screen-calibration devices, go to macworld.com/0488.) But if you aren’t, you’re still in good shape. OS X includes some handy built-in tools that can get you off to a good start. They’re worth exploring before you get into serious photo editing. I’ll walk you through the process I use to adjust pictures. Every image is a little bit different, so pay more attention to the steps I take than to the settings I use. While I may increase the saturation in this example, I might decide to decrease it in another image. Adjusting the saturation is the step, but how you adjust it depends on the image and your aesthetics. 1. Examine the Exposure Take a look at my image of a heron (see “Steps to Perfection”). The overall tones are “flat”—meaning that the middle tones dominate this scene: there isn’t much highlight or shadow detail. The Adjust palette’s histogram, to the right of the original shot, confirms this: bars representing the tonal information are bunched up in the middle ( A ). What I’d like to see is a tonal scale that stretches more evenly from shadow detail (on the histogram’s left) to highlights (on the right). Steps to Perfection The original image of the heron suffers from flat colors and soft image details ( A ). To improve it, I adjusted the Levels slider ( B ) to create stronger shadows and highlights; then I tweaked the Temperature ( C ) and Saturation ( D ) sliders to improve the color. Finally, I sharpened the image ( E ). First, I dragged the Exposure slider a little to the right, to move more of the data to the center of the histogram. Then I could’ve either used the Contrast slider to spread out the tones, or moved the shadow and highlight endpoints inward ( B ). I chose the latter for this picture. I didn’t want to bring the endpoints all the way out to the edges of the histogram, because things would still be changing a bit with the next few adjustments, as you’ll see. 3. Sharpen Up Then it was time to sharpen up the image. I moved the Sharpness slider a little to the right until the picture was nice and crisp ( E )—don’t drag it too far, or your images will have an unpleasant “digital” look. If you want to peek at the original any time during the editing process, hold down the control key—iPhoto will reveal it. That way, you can tell whether you’re going in the right direction with your adjustments. When you like the way your picture looks, either click on the Done button or simply click on the next thumbnail at the top of the editing window. iPhoto saves your changes. Don’t be concerned if you change your mind and decide that you don’t like the edits you’ve made—choosing Photos: Revert To Original at any time will take you right back to square one. You can bring out the best in any photo in your library just that quickly. Since your photo is looking so darn good after these adjustments, you might decide to make a print right now. To make sure the image is positioned correctly, crop your photo to the same proportions as the paper you’ll be using. Let’s say that you’re going to make a 4-by-6-inch print. Return to Edit mode and select 4x6 from the Constrain drop-down menu on the iPhoto toolbar. The edges of the images that don’t fit will be grayed out. Enlarge or reduce the cropping area by clicking on and dragging any corner. Once you’ve set the cropping area, click on the Crop button, and iPhoto will trim the excess. When the image comes out of the printer, it will be composed in the same way it appears on your Mac’s monitor. If you plan on printing your picture in different sizes and proportions, you may want to duplicate it before cropping (Photos: Duplicate). It’s true that you can always return to the original image if you want to undo the cropping, but you’ll also lose the image edits that you worked so hard to perfect. Duplicating the photo before cropping is more efficient. Just a short while ago, you had a camera full of digital images and no real procedure for dealing with them. Now you’ve uploaded the pictures, rated and organized them, adjusted your favorites, and cropped them to fit your output medium—and you’re ready to enjoy the fruits of your labor. You did it all within iPhoto 5, and it was almost as much fun as taking the pictures in the first place.